Dent removal in Cadnam, Southampton does not need to cost the earth!. We offer a comprehensive, affordable and quick dent removal service to get your vehicle looking like new in no time. Cadnam Garage Services in Cadnam, Southampton is committed to providing the best service for dent removal for all makes and models of vehicles. 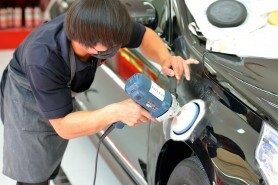 Only the best dent removal technicians will be allowed to work on your vehicle. This way, you will know that you get the best service possible. Cadnam Garage Services mechanics will be happy to answer any questions you may have, whether it is about the processes or any of the other services that we offer. Not everyone wants to bother with their insurance company. For a small dent why would you want to risk your no claims bonus? That is one of the reasons we keep our costs low. You will not need to go through the hassle of your insurance company, trying to explain how the dent occurred. We will not ask you for the details. At Cadnam Garage Services our priority is to help you and get your car back on the road. Quality Service – You Deserve It! Cadnam Garage Services takes pride in offering only a high quality dent removal service. We want to do the best for you, which is why our mechanics are highly trained in all aspects of dent removal. If you have any questions at all about dent removal in Cadnam, Southampton, please get in touch. Our team will be happy to answer all the questions you have.